Saturday 22nd April 2017 – total 1142 miles. We woke around 8am and Dave made tea and toasted a couple of hot cross buns. Got ready to go and the engine wouldn’t start. This time though Dave was unable to get it going. 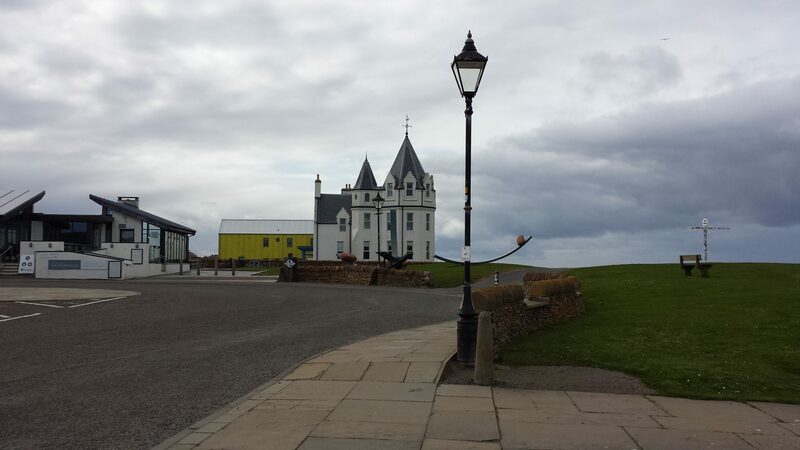 I stayed with the camper while Dave walked down to Thurso to get some help. Very cold morning so I kept warm under the duvet. Dave came back after a couple of hours having talked to a few local people who gave him the phone number of a VW enthusiast. 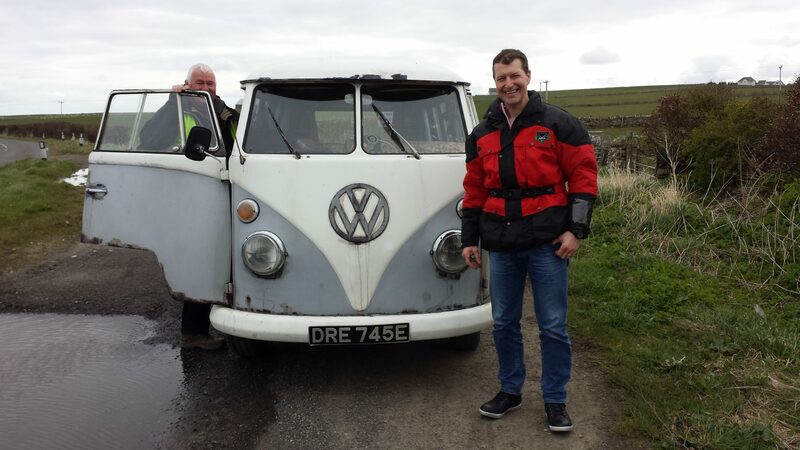 He wasn’t at work but a message was sent to him and, just as Dave arrived back his phone rang – it was Graham Gunn who owns a number of VWs. He asked where we were and five minutes later our “knight in shining armour” rode into the lay-by on his motorcycle. It took no time at all for Graham to work out what was wrong – it was the points! Soon the engine roared into life again much to our relief. 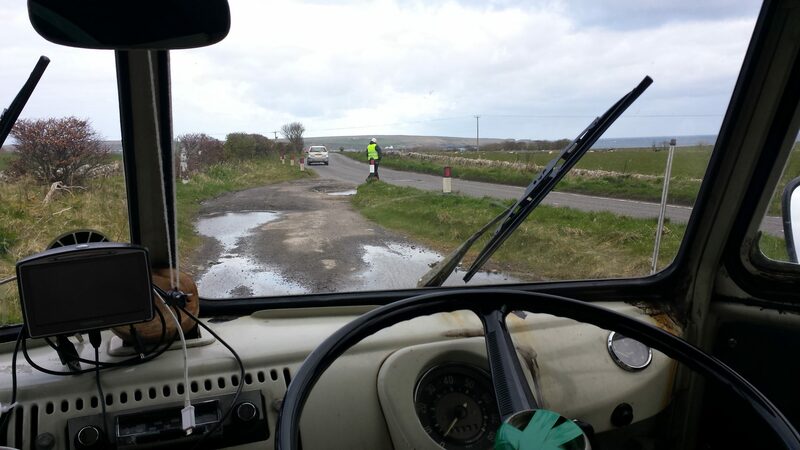 Our thanks to Graham Gunn from “Autoparts of Thurso” who changed our day from disaster to success. 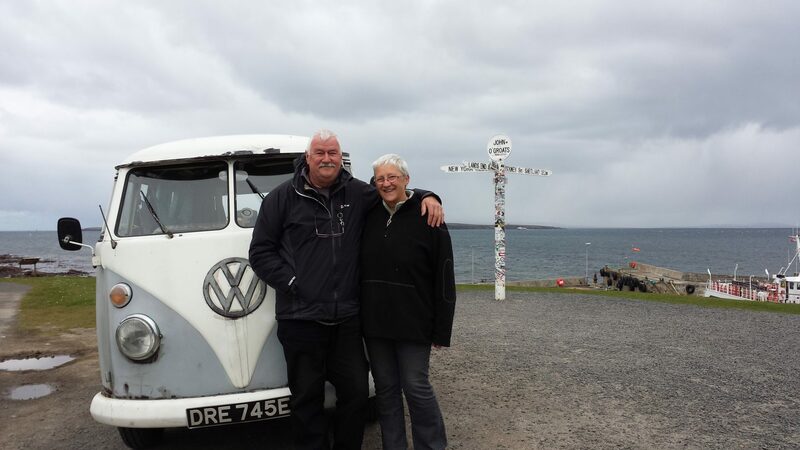 We called in to see Angela and Reg near Dunnet but no-one was home. Sorry we missed you both. We will visit again another time. 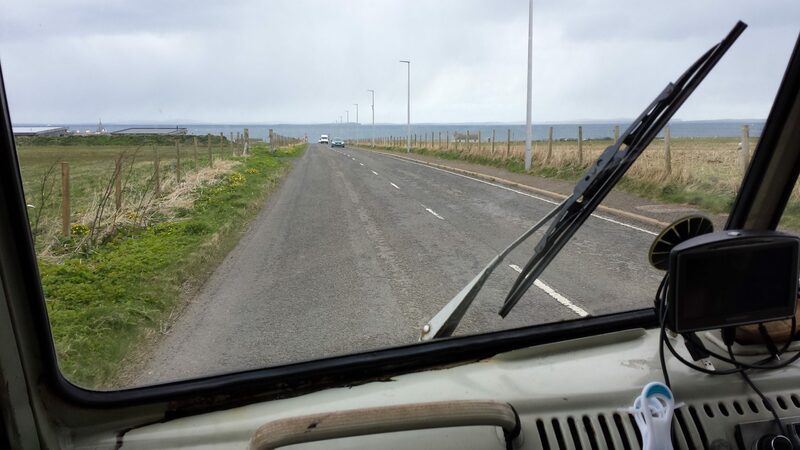 We reached John o’Groats a little later than planned around 1.30. We stood at the signpost where we stood almost a year ago and Hayley took our photo. Dave slowly backed the camper up to the signpost and Alex offered to take a few snaps of us with the van. Thanks Hayley and Alex. 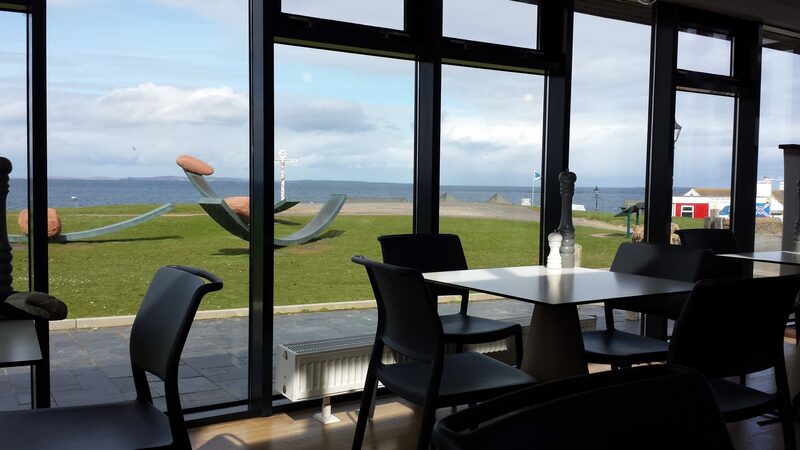 We walked into the cafe and bought a coffee each and sat admiring the view across to the sea. Although the sun was shining there was a bitterly cold wind blowing so we decided against going for a walk! 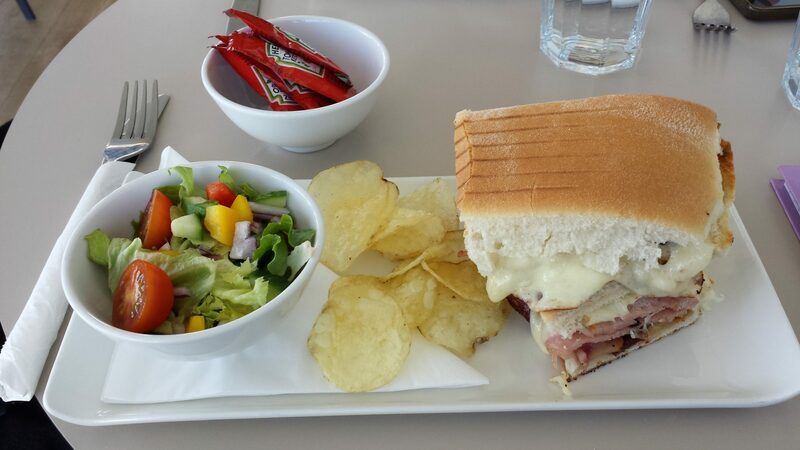 Instead we ordered some lunch – which was delicious. We met Courtney again – it was she who came and greeted us last year and asked us to sign the end-to-end book. Great to see you again Courtney and good luck with your future plans. 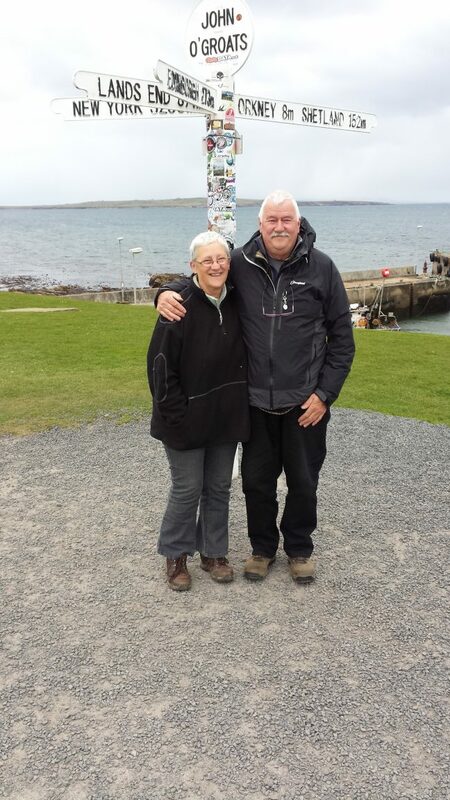 We also met a young couple who had just completed their 3-week cycle journey from Land’s End to John o’Groats taking in some of the Scottish Islands too. They live in Oxford but are both from Alaska. Well done Jake and Cathryn. Good to meet you and we wish you both success in your studies. 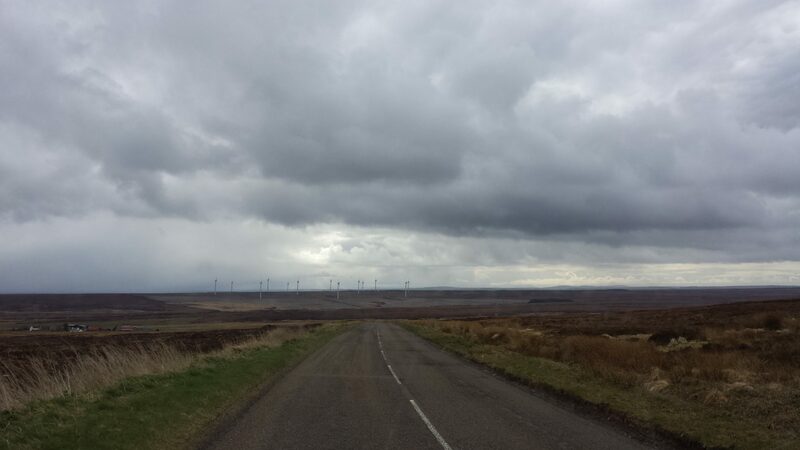 We drove away from John o’Groats just after 4.00pm heading south for home. It will take another day or four to get home as we plan to visit friends in Linlithgow and also in Lincolnshire on our way. It has been an amazing trip reliving our walk last year and who knows? We may do the walk again next year – still end-to-end but a different route. Was looking at this website lying in bed at home in Sydney this evening and reliving our journey last year. We went the other way and I cycled almost the entire route while Libby drove our various support vehicles. It was interesting to see pictures of some of the places which we both went to in Scotland. As you can see from this, I found out about your recent road retrace just now! Our trip (see http://www.shetlandtoscillyforpeace.com ) worked out OK. This last year we have been enjoying being back home in beautiful Avalon Beach in Sydney, taking a breather and doing various domestic things. However, we are beginning to get back into some peace activities. Tomorrow we will go to the presentation of the Sydney Peace Prize and Lecture. Congratulations again on your walk and fundraising last year. Thank you also for the blog which encouraged and entertained us as we prepared our journey No doubt you’ll be planning and having. more adventures before long as we will. Maybe we’ll meet at some stage!